I could live on feta cheese! Great post! I especially loved hearing about the origin of feta. You might want to look into submitting this excellent post on FoodRenegade.com's excellent weekly Friday locavore themed blog carnival too. An interesting walk down memory lane... Nice post! Those laws are destroying our traditions. Pasteurized milk doesn't give the same results. You can't compare a cheese made with pasteurized and one made with raw milk! Anyway, I love Feta and I'm lucky to find good Greek feta cheese here in Geneva. Very informative post! I am now hot on the trail of authentic feta in the Los Angeles area. As for that Krinos brand kefalograviera, is it any good? There's a shop here that has it, but they want $40 for a wheel of it, and I won't spend that much unless I know it's worth the money. As a Greek, I really enjoyed this post. And I could live on feta cheese, but I unfortunately, I cannot find a good one around me. Love this post, can't wait to see the continuation of the series. oh yum! this makes me super hungry for the REAL stuff. i love hearing about your gramma, esp in the store! too bad we're losing these old ways. thanks for the great history and sharing your family with us! Your are blessed to have such rich memories that you can share with all of us and your children. Great post! It would be really nice to be able to sample some of that unpasteurized Greek feta. Feta has quickly become my favorite cheese and I almost always have it in the fridge. It is definitely worth the trip to Greek Town to pick up some imported Greek feta. I knew it,so many fetas are lacking that authentic taste! In college, I worked at a greek restaurant where they served the real thing so many ways, my favorite was a tomato feta cheese omelet. Once you taste the real thing, you can recognize the imposters quite easily! No fake Feta could pass her judgment! And how good (and sad) is to know about Feta cheese in the Americas. I don't think you can get the real thing here (unfortunately) as it is with many imported things, you can only get closer to it. Sam - I really want to complement you on your posts.Each time I read one I am getting enriched (not with casein - lol)! 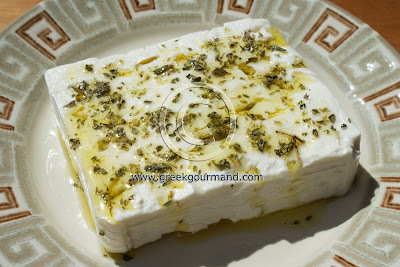 I use to live in Greece and miss the taverna's that would serve up slabs of feta w/ olive oil and rigani like this! Yum!! Thanks for this great blog! I do believe home-made feta cheese, the type of your grandma used to make, is much better than any store-bought. great story, as usual! What an interesting post! Your grandmother sounds like a woman who spoke her mind and stood by her principles. I'd give my left arm to try her cheese. hahahaha...I won't be surprised if your Yiayia made such fuss that day. She's specialist in Feta! What a grand age and grand skills. It's true nowdays, cheeses had to be pasteurised and definitely lost their original taste. Just like pasteurised milk and raw fresh milk. But if Camembert still can be found unpasteurised, why not Feta? That still left me dumbfounded. I had a fun and feta week when I was in Athens last week. I ate quite variety of fetas with my greek family (my best greek friend is nounos to my son) :-D. I was gawking at those barrels on displayed in the Feta shops and supermarkets. Like your Yiayia, I asked for sample before I purchased them. Not only that I adored Greek Soft cheeses as well. Matter of fact, I easily adapted to Greek food (as I'm originally from tropical island) compared to North European cuisine which were quite buttery and creamy to my liking. Please do feed me with more infos of Greek cheeses and other ingredients. Kala Orexi! Feta, it's a beautiful cheese! Great piece with attention on finding what is authentic. I dont eat cheese anymore..but I just loved the story about your yiayia...I can see it so clearly..! :)besides..she was right,nothing is made today as it was used to..
What an absolutely incredible story...Loved it being a family person myself. I absolutely love greek food, but have not tried to make it in my own kitchen. Hopefully, I will try my hand at a few items soon. Thank you again for the incredible story. Very informative and enlightening. Nice story about your grandma who made the real unpasteurized feta cheese. You're so lucky to have tasted her cheese. Thank you for sending me this posting. Great article Sam. I adore feta and agree - we have some terrible products claiming to be feta. Nothing beats the authentic stuff. I love feta cheese. Sometimes I have a big craving for greek salads that I just have to satisfy. I have not thought of eating feta on its own in a long time. Thanks for the post, and I am definitely going to try feta for feta's sake! This has been your single most frustrating post. I have come back to it a million times, feta in hand to check on my purchase. I can proudly announce that I, finally, found some sheep's milk feta - unfortunately only made by a Greek friend of a Greek friend (no kidding) who farms with sheep in the Karoo (a region where sheep is typically farmed in SA. There is absolutely nothing of the kind in the retailers and we can find only goat's or cows milk feta. Phew, thought I'd let you know. All of this time I thought I was actually eating Feta cheese. Now I have to search for it and find it. I have beautiful Oregano growing wild, and some luscious EVOOs. Can't wait to try the real thing! Thanks so much for an informative post. I adore good feta cheese. I'm very lucky to live near a good deli with a super cheese counter as our supermarket feta is hardly feta at all. I've lived and cooked in Greece since 1973 and have sampled dozens of Feta. My favorites are "Meteora" and "Klisouras". I would say that I love Feta but now I'm not sure that I've tasted the 'real' thing! I will have to see if I can find some imported from Greece and taste test versus what I find at the local grocery store. Thank you for all this great information! now I want to eat feta!!! How simple yet perfect for a get together with friends. I love feta cheese anyway. Keep trying the reduced fat version and it just should be called Feta Cheese. No comparison. Great post. I love feta cheese. I appreciate the interesting facts about feta. Enjoyed reading your post. Your grandmother's outburst in the store made me chuckle and reminded me of my own situation with a grandma who loved haggling with the cart vendors in Beirut. I can't remember the last time I had good feta. I have given up on it years ago!